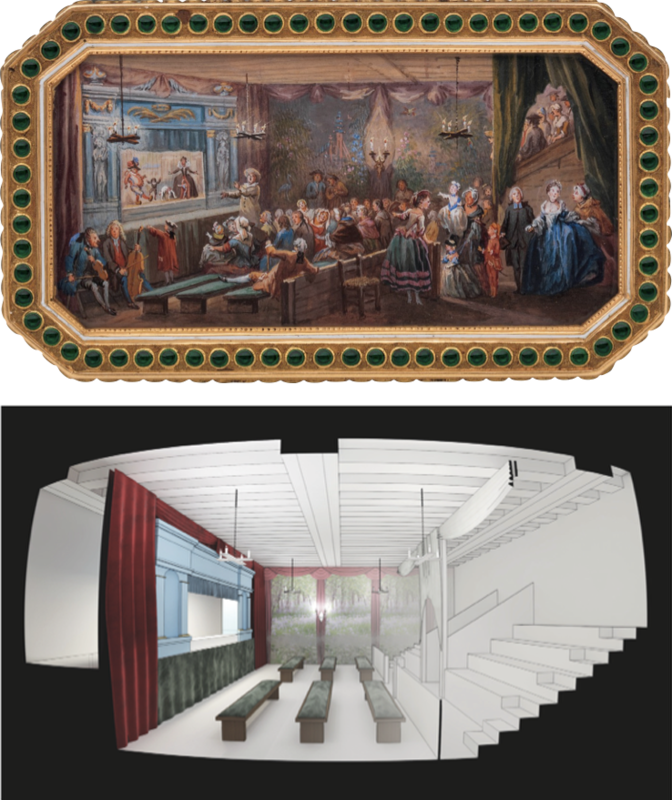 The VESPACE (Virtual Early modern Spectacles and Publics, Active and Collaborative Environment) project brings together literary, theatrical, and architectural historians with computer scientists and game designers to create an immersive, interactive “video game” based on the marginal theatres that flourished at Paris Fairgrounds in the eighteenth century. The three roundtable discussions planned for this event will share our ongoing work with the LSU community, and solicit debate and discussion around methodologies and challenges associated with modeling spatial, aural, performance, and social environments based on incomplete or unreliable archival sources. Free and open to the public; all panels will be moderated by project PI Jeffrey Leichman (LSU French Studies). The first roundtable, from 1:00pm-2:00pm, will focus on the work of Mylène Pardoen (Université de Lyon 2), a “sound archeologist” and principal investigator on the Projet Bretez (https://youtu.be/0UOGXWYL8ug), who will talk about her approach to immersive modeling of the eighteenth-century Paris soundscape. At the final roundtable, from 4:30pm-6:00pm, Florent Laroche (Ecole Centrale de Nantes), Paul François (Ecole Centrale-Université de Nantes), Jan Clarke (Durham University, England) and Panill Camp (Washington University in St. Louis) will discuss sources and issues related to architectural modeling of long-destroyed theatrical spaces, and how this process has lead to new archival discoveries. Light refreshments provided. Please contact Jeffrey Leichman (jleichman@lsu.edu) with questions or for further information. Event sponsored by the National Endowment for the Humanities, the LSU Department of French Studies, and the LSU Center for Collaborative Knowledge.